Located along the Oregon coast in Lincoln City. 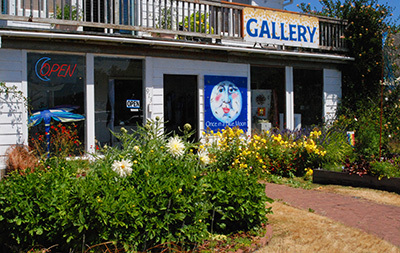 Featuring a selection of watercolor, fine art, prints, craft items created by local artists. Specializing in the whimsical-- mermaids, jesters, wizards, angels, fairy, tree spirits and items that will make you smile. You will also find hand made wearable artwork, jewelry, scarves, purses, socks, photography, sculpture, and of course plenty of moons and celestial items.